What's Your Company's Risk Level? Recorded Future Intelligence Cards consolidate available indications of risk into a single view for security teams. This complimentary resource is a limited view of your company's threat environment. Your company's risk score is a number between 0 and 99, determined by which rules are currently triggered. We'll provide the range and criticality label. Our risk rules are the primary means for evaluating companies and third parties. 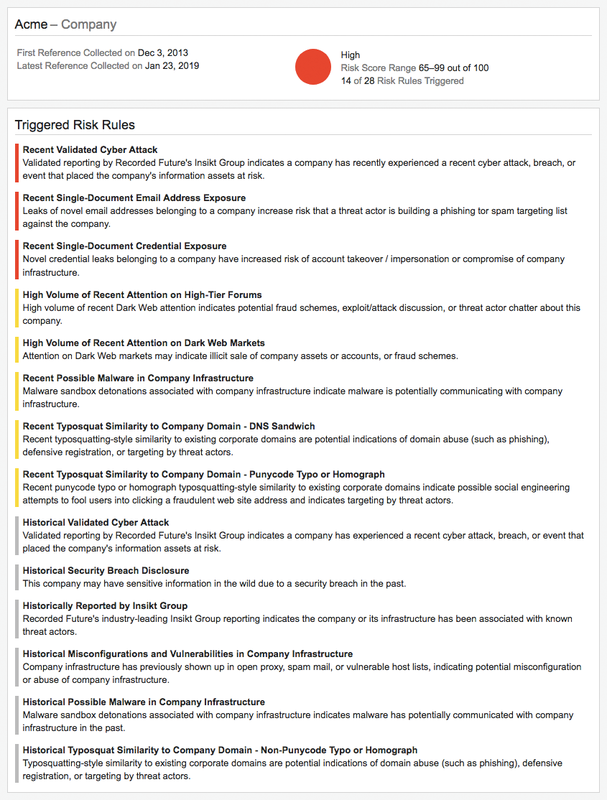 Your report will show which rules are currently triggered for your company. We provide full transparency into the methodologies and types of data to determine an entity’s cyber risk score. Your report will include a summary of each risk rule.